Building on the successful launch of a brand new presentation centre and a stylish new website, Empire Communities is now offering one year free maintenance, interest, and taxes at Eau du Soleil. This exciting new promotion is only available for a limited time so make sure to register here for more information. The 66 and 46 storey Zeidler Partnership and E.I. 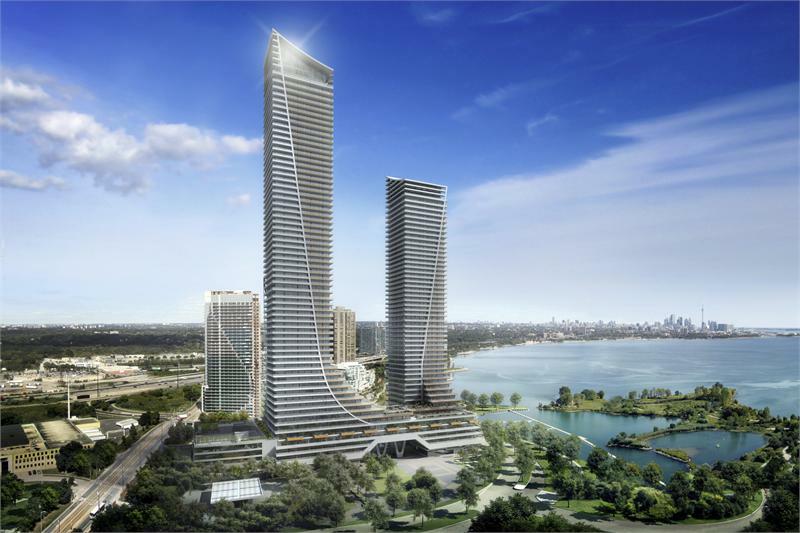 Richmond Architects­-designed towers will soon rise along the scenic Humber Bay waterfront. The area, just west of downtown Toronto has seen a significant transformation in recent years with old strip motels demolished to make way for grand condominium towers, including Empire’s own Beyond the Sea community. Nature lovers, joggers, and cyclists alike will love Eau Du Soleil’s proximity to Humber Bay Park, Humber Bay Shores Park, and the Martin Goodman Trail,­ not to mention the sweeping views of the Humber Bay shoreline and Toronto skyline. Other nearby amenities include coffee shops, restaurants and grocery stores including Tim Hortons, Eden Trattoria and Sobeys. Inside the 1,256-unit complex, residents will have access to a wealth of luxury resort-­style amenities, state­-of-­the-art entertainment facilities, outdoor areas, and health and wellness facilities. These include a 24­ hour concierge, theatre, billiard, and games rooms, lounges, fitness centre, indoor salt-­water pool and whirlpool, dry saunas, and a yoga and pilates studio just to name a few. In addition, the seventh floor infinity terrace will feature barbecues, a fire pit, cabanas, and lots of seating areas to enjoy the outdoors. The suites at Eau du Soleil start in the mid $300,000s and range in size from 480 square feet to 1,243 square feet. Standard features include a premium stainless steel appliance package, granite countertops, framed glass showers with rain shower heads, and nine to 10 foot ceilings. And, to top it all off, Empire Communities is an acclaimed developer behind several fast-selling new condos in the GTA. How’s that for reputable? For more information on Eau du Soleil email eauds@empirecommunities.ca or visit their website at eaudusoleil.empirecommunities.com.